University open to all classes, creeds, etc. Powers of the Vice Chancellor. Powers and duties of the Syndicate. Powers and duties of the Academic Council. Board of Advanced Studies and Research. Functions of the Board of Advanced Studies and Research. Functions of the Selection Board. Functions of the Finance and Planning Committee. Appointment of Committees by Authorities. An Act to provide for the establishment of the Information Technology University of the Punjab. Short title and commencement.– (1) This Act may be cited as the Information Technology University of the Punjab Act 2012. (v) “Vice Chancellor” means Vice Chancellor of the University. 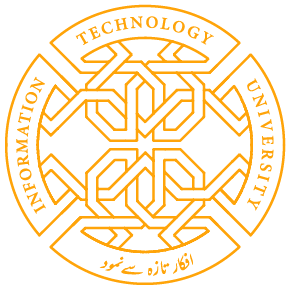 Establishment of the University.– (1) The Government shall, by notification, establish a University to be called the Information Technology University of the Punjab with its campus located at Lahore. (3) The University may, with the approval of the Chancellor, open a sub-campus of the University. (g) officers and members of the staff of the University. (t) perform any other prescribed or ancillary function. (j) exercise any power ancillary to the above powers or as may be prescribed. University to be open to all classes, creeds, etc.– The University shall be open to all persons irrespective of their religion, race, creed, class, gender or color and the University shall not deny its privileges to a person on any such ground. Fee and other charges.– The University may prescribe and, from time to time, increase fee and other charges with the approval of the Syndicate. Jurisdiction.– The jurisdiction of the University shall extend to the whole of the Punjab. (j) such other persons as may be prescribed. Chancellor.– (1) Governor of the Punjab shall be the Chancellor of the University. (2) The Chancellor or a nominee of the Chancellor shall preside at convocation of the University. (3) The University may, on the recommendations of the Syndicate and subject to prior approval of the Chancellor, confer an honorary degree. (4) In the performance of all the functions under this Act, the Chancellor shall act and shall be bound in the same manner as the Governor of a Province acts and is bound under clause (1) of Article 105 of the Constitution of the Islamic Republic of Pakistan. Inspection and inquiry.– (1) The Chancellor may direct inspection or inquiry into the affairs of the University. (2) The Chancellor shall convey the views with regard to the result of the inspection or inquiry to the Syndicate and may, after ascertaining the views of the Syndicate, recommend any remedial action to the Syndicate. (3) The Syndicate shall, within the time specified by the Chancellor, submit a report to the Chancellor about the action taken on the recommendation of the Chancellor. (4) The Chancellor may set aside a decision or action of the Syndicate, which, in the opinion of the Chancellor, is against the law, interest of academic excellence of the University, religious or cultural ideology, or national integrity. Vice Chancellor.– (1) A person who is eligible and who is not more than sixty five years of age on the last date fixed for submission of applications in the advertisement for the post of the Vice Chancellor may apply for the post. (2) The Chancellor shall determine, by notification in the official Gazette, the qualifications, experience and other relevant requirements for the post of the Vice Chancellor. (3) The Chancellor shall constitute a Search Committee consisting of not less than three and not more than five members for making recommendations for appointment of the Vice Chancellor. (4) The Search Committee shall follow such procedure and criteria for selection of the panel for the post of the Vice Chancellor as the Chancellor, by notification, determine. (5) The Search Committee shall recommend to the Chancellor, a panel of three persons who, in its opinion, are suitable for appointment as the Vice Chancellor. (7) The Chancellor shall determine the terms and conditions of service of the Vice Chancellor. (9) If the office of the Vice Chancellor is vacant or the Vice Chancellor is absent or is unable to perform the functions of the Vice Chancellor owing to any cause, the Pro-Vice Chancellor shall perform the functions of the Vice Chancellor but, if at any time, the office of Pro-Vice Chancellor is also vacant or the Pro-Vice Chancellor is absent or is unable to perform the functions of the Vice Chancellor owing to any cause, the Chancellor shall make such temporary arrangements for the performance of the duties of the Vice Chancellor as he may deem fit. Powers of the Vice Chancellor.– (1) Subject to this Act, the Vice Chancellor shall be the chief executive officer of the University and shall ensure that the provisions of the Act, statutes, regulations and rules are faithfully observed. (2) The Vice Chancellor may attend a meeting of any Authority or body of the University. (f) exercise such other powers as may be prescribed. (4) The Vice Chancellor shall prepare an annual report containing information as regards the preceding academic year including disclosure of all relevant facts pertaining to academics, research, administration and finances of the University. (5) The Vice Chancellor shall, within three months of the end of an academic year, submit the annual report of the University before the Syndicate. Pro-Vice Chancellor.– (1) The Chancellor shall nominate the Pro-Vice Chancellor of the University, from amongst three senior most Professors of the University, for a term of three years. (2) The Pro-Vice Chancellor shall perform such functions as may be assigned to him under this Act, statutes or regulations. (3) The Syndicate or the Vice Chancellor may assign any other functions to the Pro-Vice Chancellor in addition to his duties as Professor. Registrar.– (1) The Syndicate shall appoint a Registrar in such manner and on such terms and conditions as may be prescribed. (2) The Syndicate shall not appoint a person as Registrar unless he possesses the prescribed qualifications and experience. (4) The Registrar shall hold office for a term of three years. Treasurer.– (1) The Syndicate shall appoint a Treasurer in such manner and on such terms and conditions as may be prescribed. (2) The Syndicate shall not appoint a person as Treasurer unless he possesses the prescribed qualifications and experience. (e) perform such other functions as may be prescribed or assigned to him by the Syndicate. (4) The Treasurer shall hold office for a term of three years. Controller of Examinations.– (1) The Syndicate shall appoint a Controller of Examinations in such manner and on such terms and conditions as may be prescribed. (2) The Syndicate shall not appoint a person as Controller of Examinations unless he possesses the prescribed qualifications and experience. (3) The Controller of Examinations shall be a whole-time officer of the University and shall be responsible for all matters connected with the conduct of examinations and perform such other duties as may be prescribed. (4) The Controller of Examinations shall hold office for a term of three years. Appointments.– The University may appoint such persons in its service as may be necessary in such manner and on such terms and conditions as may be prescribed. (g) any other Authority as may be prescribed. (2) The Syndicate may constitute committees consisting of the members of the Syndicate or it may create committees consisting of members of the Syndicate or teachers or officers of the University or a combination of all or any of such persons. (k) two Principals of affiliated colleges [including at least one female Principal, if available] to be nominated by the Vice Chancellor. (3) The members of the Syndicate, other than ex-officio members, shall be nominated for a period of three years and shall hold office during the pleasure of the Chancellor. (4) Nine members shall constitute the quorum for a meeting of the Syndicate. Powers and duties of the Syndicate.– (1) The Syndicate shall be the executive body of the University and shall, subject to the provisions of this Act and statutes, take effective measures to raise the standard of teaching, research, technological development, publication and other academic pursuits and exercise general supervision and control over the affairs of the University and management of the property of the University. (zb) perform such other functions as may be assigned to it under this Act and the statutes. (h) Librarian of the University. (2) The members of the Academic Council shall hold office for three years; and if the office of any such member becomes vacant before the expiry of the term, the vacancy shall be filled for the remaining period in the prescribed manner. Powers and duties of the Academic Council.– (1) The Academic Council shall be the academic body of the University and may lay down proper standards of instruction, research, publication and examination and to regulate and promote the academic life of the University and affiliated colleges. (k) perform such other functions as may be prescribed by the statutes. (e) one member to be nominated by the Vice Chancellor. (2) The members other than ex-officio members of a Board of Faculty shall hold office for a period of three years. (3) The quorum for a meeting of a Board of faculty shall be one half of the total number of members, a fraction being counted as one. (e) perform such other functions as may be prescribed by statutes. (3) Five members including at least one expert shall constitute the quorum for a meeting of the Selection Board. (4) No member who is a candidate or whose family member is a candidate, for a post to which appointment is to be made, shall take part in the proceedings of the Selection Board for selection of a candidate on such post. (5) In selection of candidates for the post of Professor or Associate Professor, the Selection Board shall co-opt or consult three experts in the subject and in selecting candidates for any other teaching post, two experts in the subject, to be nominated by the Vice Chancellor from a standing list of experts for each subject approved by the Syndicate. (6) The Syndicate may approve or revise the standing list of experts of a subject on the recommendation of the Selection Board. (b) consider all cases of promotion or selection of officers of the University and recommend the names of suitable candidates for such promotion or selection to the Syndicate. (3) Five members of the Finance and Planning Committee shall constitute the quorum for a meeting of the Finance and Planning Committee. (d) perform such other functions as may be prescribed by the statutes. Appointment of Committees by Authorities.– Any Authority may constitute such standing, special or advisory committees as it may deem fit, and appoint to such committees persons who may not be its members. Statutes.– (1) Subject to the provisions of this Act, the Syndicate may make statutes. (n) all other matters which are to be or may be prescribed or regulated by statutes. (3) The Syndicate shall recommend statutes under clauses (a) and (b) of subsection (2) to the Chancellor who may approve the statutes with or without any modification or may refer the statutes back to the Syndicate for reconsideration or may reject the statutes. (n) all other matters which under the Act or the statutes are to be or may be prescribed by regulations. (2) The Academic Council shall prepare and submit the regulations to the Syndicate and the Syndicate may approve them with or without modifications or refer them back to the Academic Council for reconsideration or reject them. Rules.– (1) An Authority or a body of the University may make rules consistent with this Act, statutes and regulations, to regulate the conduct of its business. (2) The Syndicate may direct any Authority or body of the University to amend or repeal any rules made by the Authority or body. University Fund.– (1) There shall be a fund to be known as the Information Technology University Fund which shall vest in the University and to which shall be credited all sums received by the University. (2) The University may accept donations in the shape of land, vehicle, equipment or any other item that may facilitate the functioning of the University and all such donations shall be used, maintained and disposed of by the University in the prescribed manner. Budget, audit and accounts.– (1) The budget of the University shall be approved and its accounts shall be maintained and audited in such manner as may be prescribed by theSyndicate. (2) The Syndicate may approve the budget of the University, appropriations of accounts of the University and settle an audit para relating to the audit of the University. (3) The Syndicate may delegate the power of appropriation or re-appropriation of funds to an officer of the University. Resident Auditor.– The Government shall appoint, on deputation, an appropriate officer of the Government as the Resident Auditor of the University. Appeal to Syndicate.– (1) If an order is passed by an Authority, body or officer of the University, other than the Chancellor or the Syndicate, and an appeal against the order is not provided under the statutes or regulations, any aggrieved person may prefer an appeal against the order to the Syndicate. (2) The Syndicate may constitute a committee of its members to hear and dispose of any appeal on behalf of the Syndicate. (3) If a member of the Syndicate is the officer who passed the order or who is also member of the Authority against whose order appeal is filed before the Syndicate, such member shall not hear the appeal as member of the Syndicate or be part of the committee constituted to hear and dispose of the appeal. Removal of difficulties.– If any difficulty arises in giving effect to any of the provisions of this Act, the Government may give such directions, not inconsistent with the Act, as it may consider necessary for the removal of such difficulty. 39. Indemnity.– No suit or legal proceedings shall lie against the Government, the University or any Authority, officer or employee of the Government or the University or any person in respect of anything which is done in good faith under this Act.